Our Mission: TO PUT THE RIGHT PUP IN THE RIGHT ARMS. Us: Let’s have an honest chat about what we do. We want to be as transparent as possible so that you can comfortably make your decision to become a part of our golden family. When you purchase one of our Chinook Goldens, there is a lot of expense, time and sweat in the background that you don’t see. Hopefully, after reading this, when you look into the eyes of your new little friend, you will see what is all included to make this a great companion for you – and what it takes to put the right pup in the right arms! 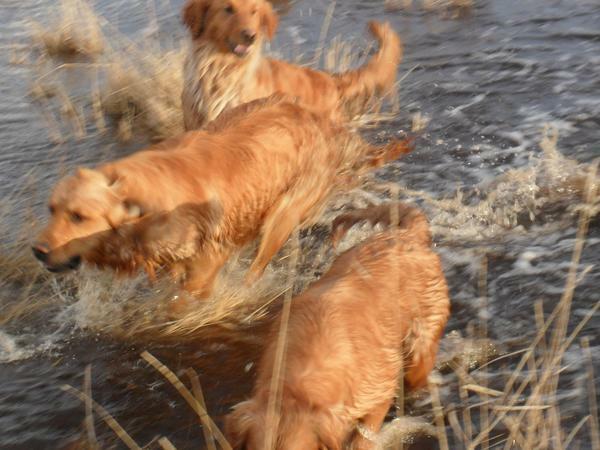 Janelle and I, with our 4 children, have been working with Goldens for about 10 years. We live on 20 acres in the Chinook country of central Alberta. Janelle is the customer communicator and secretary for our team. The children help with the cleanup and care and I’m the physical connection -companion/trainer to our dogs. We love what we do and we are doing what we love. 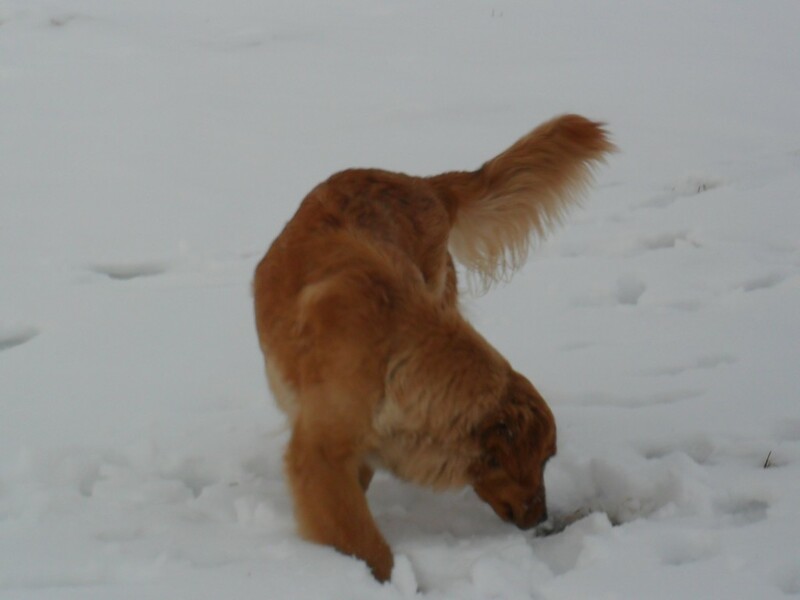 Bloodlines: Our line of Goldens is not the chunky show dogs. They are slender, athletic, and very intelligent. They make great trail companions, hunting/working dogs, as well as house pets. 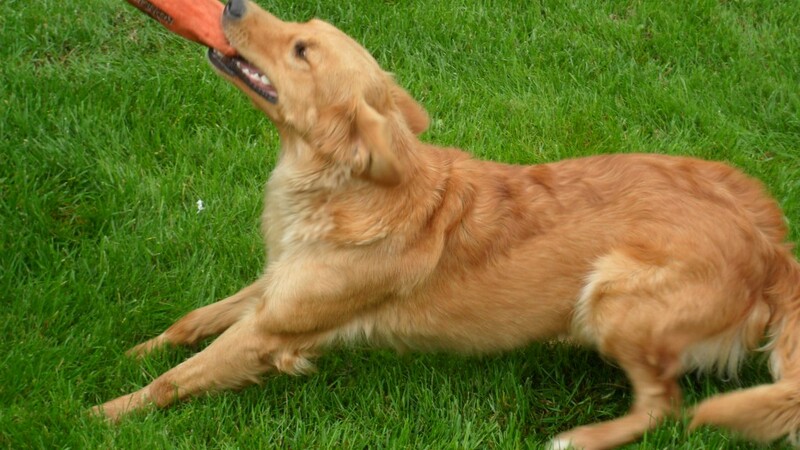 Goldens are companion dogs first and foremost. 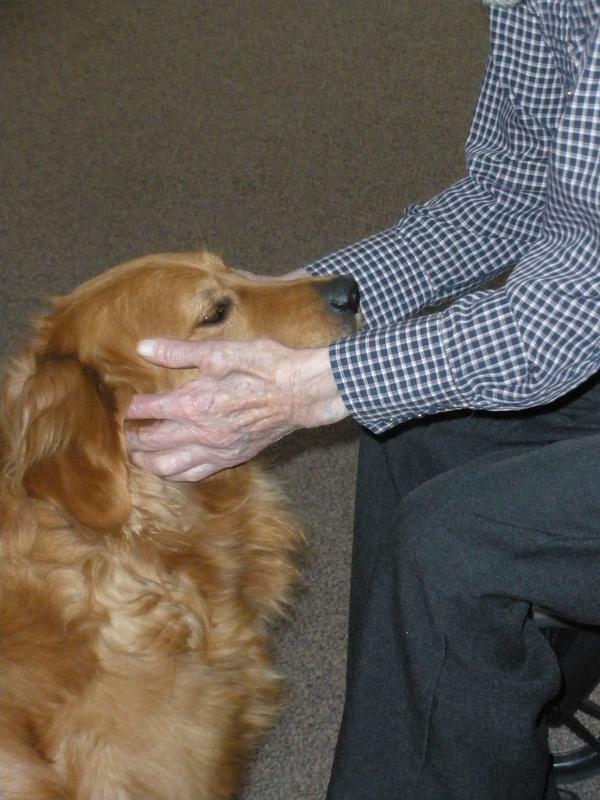 (You can see in the picture, one of our Goldens has been living successfully in a long-term care home for elderly for over 4 years now.) They vary in size so take note when choosing a litter. Our aim is to continue to improve our bloodlines, which is an exciting and ongoing work. Fitness: Pretty much every day when I get home from the office (Managing Director of Westview Care Community- westviewcare.ca) I head for the fields with our dogs. Right now we have our male, Guy William, and our beautiful team of 4 females as part of the Chinook Goldens track and field team. Added to this is our son’s golden, Arya, and then the old family pet, Bwana, who only goes as far as he cares to, and takes short cuts where he can. I go about 3 miles and they easily triple that. It’s hills, trees, pasture, and water. We all come home dirty and happy. Their tongues are usually hanging out further than mine. We feel that though this fitness regime is time consuming, it makes for healthier dogs (and owner) which makes for healthier and better adjusted parents to your pups. Health: At approximately 18 months of age we x-ray the hips and elbows of our dogs. These are sent to OFA for careful screening. This is considered a preliminary x-ray because they must be 24 months to get what they call hip certification. We want to be sure that they are suitable for breeding. At 24 months we do the actual certifications for hips and elbows of which are posted on OFA website. We take all of our adults to the Ophthalmologist at the Calgary Care Center for their eye certifications. This goes through OFA also. Besides the above, our dogs have an annual health check at our vet. This includes shots, and a physical check including heart etc. Breeding: Depending on their cycles, our females’ first breeding usually takes place between 20 – 26 months, after they have had satisfactory hip/elbow x-rays and eye certifications. Our policy is to have approximately one litter per year. Facility: Now a little on our facilities. Someone commented, “You have all this space for just your dogs!” Yes, our “Dog House” is 2,400 square feet, has a 13 foot ceiling, and has floor heating for our long, cold winters. Each dog has free access to this area, winter or summer. We have three large whelping pens in this attractive area as well. When you step into our Dog House you will be impressed by the clean, friendly, country atmosphere we have created for our dogs. It’s not veterinarian like, it’s home to our dogs, a country dog lodge. You: It is our wish to establish long term relationships with our buyers. 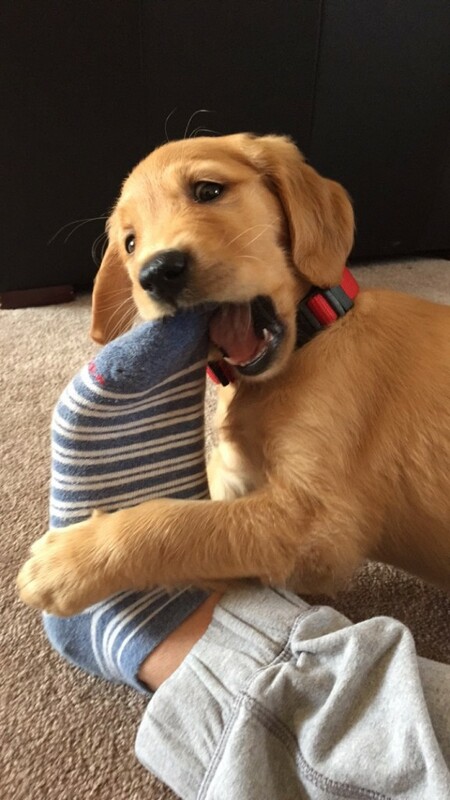 We so much appreciate pictures and communications as our little pups grow up and make their way into your hearts and homes. We are here to provide help and guidance for the life of your pet. In conclusion: We have shared openly what we do and how we do. We feel good about what Chinook Goldens has to offer its dogs and customers and welcome you to visit us. However, we realize that we can’t meet everyone’s likes and expectations. As the new owner you need to be comfortable about your new addition and where he/she comes from. Please ensure that you are satisfied before making a commitment with us as we take commitments seriously; as much on our part as yours.